The locals refer to the Falling Spring as “a little gem”. I know I certainly do, because it is not only a limestone spring stream but also one I can be fishing within 10 minutes after I leave my home. The town side has a delayed harvest section starting at 5th Avenue and upstream until it crosses route 30. From there, the stream flows through the meadow along the Falling Spring road. This is the Heritage section and is Catch and Release and holds wild fish (some over 2 feet). According to “The Wonderful World of Trout” by Charlie Fox, fingerling “steelheads” were planted in the Falling Spring which were the Shasta River strain. These rainbows naturally reproduce in “the Spring”. In August of 2012, the Falling Spring Chapter of Trout Unlimited completed a improvement plan with the help of the Pennsylvania Fish and Boat Commission on the stretch along the private property of Carl and Becky Helman. 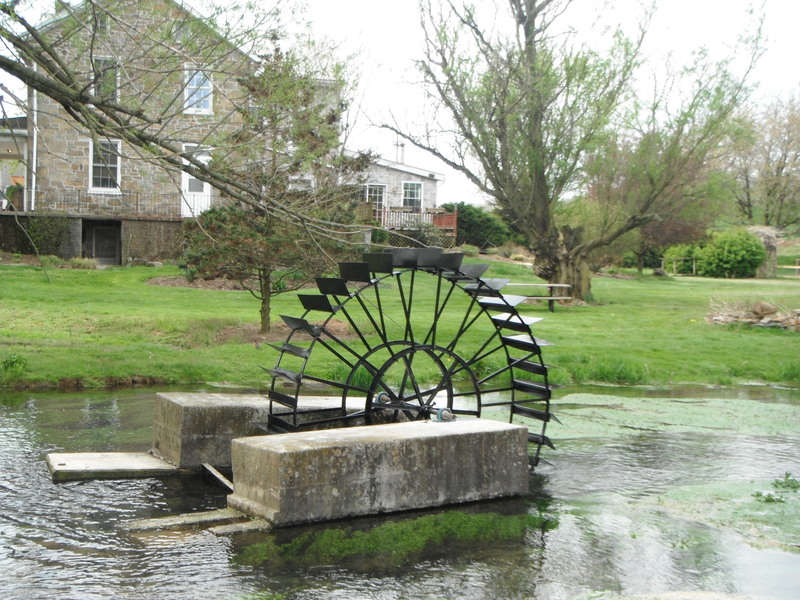 Recently the historic water wheel on this stretch was refurbished and reinstalled which makes a neat showcase for this scenic area of the Falling Spring. Fishing has been picking up on the Falling Spring. Over the last week, I have spent time on “the Spring” with Ron Hill, Tim Brookens, my son Craig, granddaughter and grandson. Caddis hatches are somewhat prevalent as well as midges. Even though the trout are not actively rising, we are catching some on the surface. Sulphur hatches will be coming soon and then Tricos, not to mention the ever present opportunity to catch rising fish on ants and beetles. Dry Fly season is on!!!! Wow, that’s a beautiful picture. Thanks. The wheel was sandblasted by T. B. Wood’s and powder coated by APX, St.Thomas. Both companies did this free of charge for the community. And yes, it is a beautiful section….we could easily take for granted! Next time you make a trip to Chambersburg, we will go. Spoke with John Trail the other day & he mentioned he ran into you on the Falling Spring. Told me about your Blog & enjoyed reading so I thought I would say hello & we should get together & do some fishing. Hope you are having a good fishing season. Right now, I am at Pine Creek area fishing Pine Creek, Kettle Creek, Crossfork, Slate Run, Cedar Run and the Allegheny River. Give me a call sometime and we will wet a line together. It’s been many years since I last fished Pine/Kettle Creeks & Slate Run but I still have some very fond memories of those waters. Hope your having a great time! Are you retired? or are you just fishing evenings & weekends? I’ll be going out West (Co & NM) in August & am looking forward to fishing cold waters again. We missed the big hatches, but catching fish on small dries and some attractor flies. Caught some big fish and some nice wild ones. Not retired yet. Fishing evenings, weekends and on vacation.